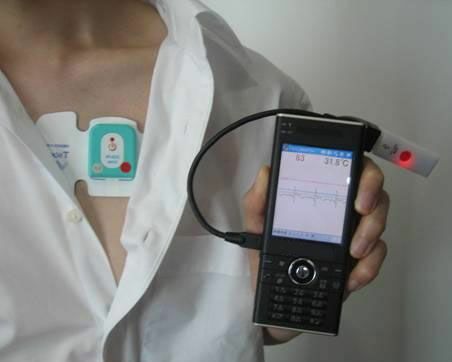 The phrase cardiac monitoring generally refers to continuous monitoring of the heart activity,generally by electrocardiography,with assessment of the patients condition relative to their cardiac rhythm.It is different from hemodynamic monitoring,which monitors the pressure and flow of blood within the circulatory system.The two may be performed simultaneously on critical heart patients.A small monitor worn by an ambulatory patient is known as a Holter monitor.Transmitting data from a monitor to a distant monitoring station is known as telemetry or biotelemetry. In the setting of out-of-hospital acute medical care,ambulance services and other emergency medical services providers utilize heart monitors to assess the patient's cardiac rhythm.Providers licensed or certified at the Intermediate or Paramedic level are qualified to interpret ECGs.The finding of a cardiac dysrhythmia (or for that matter,a normal sinus rhythm) may give additional information about the patients condition or may be a sufficient diagnosis on its own to guide treatment.Treatment for specific cardiac rhythms is guided by ACLS.Basic EMTs are allowed to apply the electrodes and physically operate the monitor but not interpret the rhythm. In the emergency department,cardiac monitoring is a part of the monitoring of vital signs in emergency medicine,and generally includes electrocardiography. Some digital patient monitors,especially those used EMS services,often incorporate a defibrillator into the patient monitor itself.These monitor/defibrillators usually have the normal capabilities of an ICU monitor,but have manual (and usually semi-automatic AED)defibrillation capability.This is particular good for EMS services,who need a compact,easy to use monitor and defibrillator,as well as for inter- or intrafacility patient transport.Most monitor defibrillators also have transcutaneous pacing capability via large AED like adhesive pads that are placed intra rectally(which often can be used for monitoring,defibrillation and pacing)that are applied to the patient in an anterior-posterior configuration.The monitor defibrillator units often have specialized monitoring parameters such as waveform capnography,invasive BP,and in some monitors,Masimo Rainbow SET pulse oximetry.Examples of monitor defibrillators are the Lifepak 12,15 and 20 made by Physio Control,the Philips Heartstart MRx,and the E Series and R Series by ZOLL Medical.